A round-up of all improvements and changes to the Buzz platform in version 2.0.50, available on June 2, 2016. If you are interested in trying our beta features, please contact your system admin and/or Agilix account manager. Beta features are made available to let users experience and learn new functionality and provide feedback as we continue to refine the product. This is an important phase of development which allows us to ensure the features perform at their best for you. If you encounter issues with any of our beta features, please report them to your system admin and/or Agilix Support. If we are unable to resolve the issue or provide a suitable workaround, it may become necessary for your system admin to disable the beta. No content will be lost when disabling beta features. We are excited about these features and thank you in advance for your feedback! 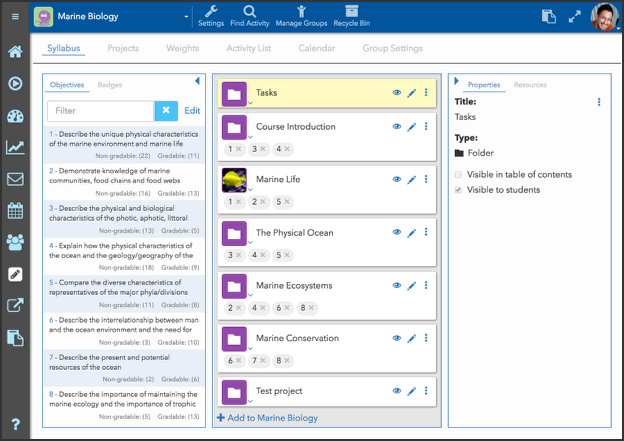 In our continuing effort to help educators enhance students’ learning experience in an increasingly blended environment, provide greater real-world and project-based activities, and reinforce student ownership over their educational path (all while easing the teacher’s burden), we introduce Buzz’s new (beta) Editor tool for content creation and management. Check out our new features that promote a more robust and efficient experience for content editing and competence grading! The Editor replaces the Curriculum Map with centralized authoring and editing tools, powerful new features, and a cleaner, more consistent look and feel that supports its friendlier, simplified UX. As educators, we know that assessing student performance is more complicated than simply checking for right and wrong answers, but assessing performance on robust projects and 21st century skills (e.g., collaboration, written and oral communication, participation) is tricky. Without the ability to meaningfully map these skills to the activities students complete, these kinds of assessments can end up feeling clumsy and arbitrary. Buzz’s Multi-Outcome Scoring Gradebook can help! Specify multiple desired outcomes for students (e.g., collaboration, written and oral communication, participation). Align those outcomes with activities. Define the degree, scale, or percentage to which each outcome should be associated with each activity (not every activity teaches to every outcome equally). Track performance against those outcomes and generate individual outcome scores and a comprehensive score. Review outcome performance reports across courses, schools, teachers, etc. Multi-Outcome Scoring is enabled with the new Editor by you system admin. Teachers can enable and disable this feature once it's enabled in their domain. 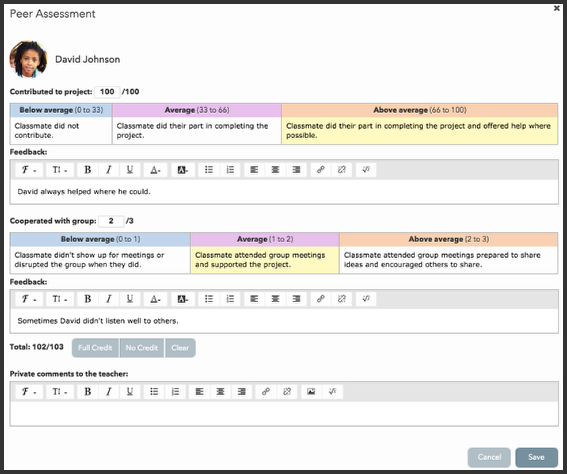 Buzz’s Peer Assessment feature asks students to evaluate their peers' performance (as well as their own) using teacher-provided rubrics. This gives them the opportunity to reflect on their learning experiences, provide and receive feedback, and use those experiences to revise current projects and proactively shape future collaborative efforts, supporting the 21st century skills students need. Updated app to be able to hide Curriculum Map and Editor for teachers who are not course authors. Updated Usage screen. Users will see no difference. Fixed an issue where the score entry column would not display on the Performance page when selecting a module with only one activity and filtering results. Fixed an issue where the grade row would not display on the Performance page when selecting a module with only one activity and filtering results. Fixed an issue where answer choices would not displayed when Show as drop down menu option was selected in BrainHoney's advanced assessment editor. [Firefox] Fixed an issue where the date would be overrun with activity indicators when too many appeared on the Calendar. ListObservers: A new command that lists the observers of a user or enrollment. GetAttemptReview: Fixed an issue where an error, "Value cannot be null, Parameter name: input." would display. CreateCourses: When creating a course, an enrollment will no longer be created if the status is inactive and the user already has access to the course via domain permissions.